[ACT](VC/RC)[1/Turn]:COST [Soul Blast (1)], and one of your vanguards gets [Power]+5000 until end of turn. 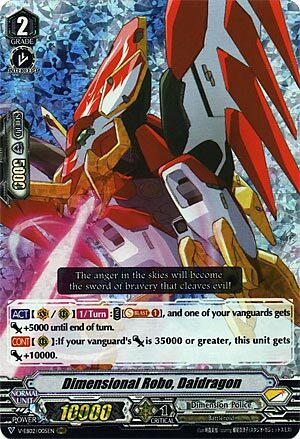 [CONT](RC):If your vanguard’s [Power] is 35000 or greater, this unit gets [Power]+10000. Too good not to run in D-Police. Not only does this aid in Daiyusha numbers, he himself becomes a huge attacker when you do. He combines especially nicely the turn you Superior Ride Great Daiyusha as between those 2 he becomes a 30k attacker unboosted, which stacks nicely with your 4 chances that turn to reach a Critical Trigger.